We are lucky to be enrolled in the first NPU-QMUL Summer Camp.In the second week of the Camp,we paid a visit to the Greenwich, the World Heritage Site, London’s prettiest royal park and the Prime Meridian of the World – longitude zero. Different from other groups, we took a special way–a tunnel deep beneath River Thames. As we slowly reached the bottom, the wet air with typical smell came to our faces. There is a big elevator in the tunnel so that a lot of cyclers take their bikes to across the river.We have to say, walking underneath the water is a fantastic experience. In the afternoon, we have a relaxing picnic in the Greenwich Park. Our lunch is a meat pie, popular among native people. To be honest, the taste of this beef pie is really strange, to some degree, tasteless. After lunch, the agreeable sunlight makes us sleepy so we had a nap on the soft warm grass. It’s very common to see people lying on the grass in the shade everywhere, even in the small park in the downtown,just chatting with friends, having some drinks or admiring the beautiful sceneries around. We think British people do have a unique understanding of how to lead an enjoyable life. The enjoyable and instructive trip has left deep impressions on us. In this day, we came to the Greenwich. We visited the Greenwich Museum and Greenwich Park in this journey. What impressed me most is British people’s "grass culture" in the clean and beautiful parks. Compared to the Chinese relaxing way, British people prefer sharing the time with their family or friends in the grass of park.The Greenwich Park is beautiful,but the deeper reason that Greenwich Park attracts me is that it really gives us a relaxing and peaceful feeling. In the park, children run after each other to have fun and adults rest under the shade of the tree. The park is popular but it is hard to find rubbish on the grass. People just enjoy their own quiet time. I do not mean we should learn this grass culture. But in this fast-pace age, after economy has developed smoothly, our nation should find a suitable way to form our own relaxing culture to find peace in our heart. On Monday of the second week, the whole crew went to the Greenwich to have sightseeing. Each group could choose a way for transportation, from either the underground or the river boat. However, our group chose to take a bus. Riding the huge bus running in the narrow streets made me highly praise the bus driver. For me, it was a trip much funnier than the underground and the riverboat cruise. It seems that in London, all the bus drivers are especially skillful in driving big bus. When we mention "travel", things appear in our minds may be walking around and taking selfies in front of different landmarks. But for us, the best thing in Greenwich was to lie on the grass and relax. When I closed my eyes and felt the wind, I could feel the embracement of nature. It was totally a unique way of traveling in London. In my memory, things about the Maritime Museum and the university are not as vivid asthe great sunshine and delicious pie. That day was special for me because I left my camera SD card in the dorm;therefore, I could totally enjoy the great view in Greenwich and meeting with different people, not worrying about taking pictures. Greenwich is a place that helps me explore my in-depth heart. In the first light of morning sun, we left Queen Marry University of London and headed for Greenwich. A bus is always the best way to travel around the city. The sightseeing was great when we climbed up to the second floor. We were surprised by the fantastic tunnel under River Thames.It was so amazing! Greenwich is not only famous because of its historic atmosphere but also its beautiful scenery. Lying on the grass was the best experience of my life. 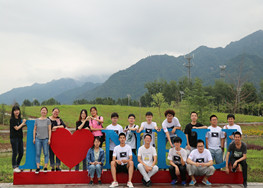 We seldom went to the park and had a beautiful afternoon with friends in China before. We all had our mind and body relaxed in British culture atmosphere, fully enjoying the food and drinks under the trees. Time moved quickly. But it reminds me that in city life everything moves quickly. In 21st century,people are ruled by a powerful machine, living in a mechanical, repetitive life. They have money to earn, a life to struggle, and a family to raise. More and more people are lost in neon lights of city. It’s not a bad idea to stop a while and try to forget everything while lying on the grass. It all comes to me that life is not always boring, and all we need is to stop and take a rest. As for me, the most unforgettable part about the trip to Greenwich is the time we had in the Greenwich Park. The scenery there is really good so we decided to buy some food and have a picnic in the Greenwich Park. The park in England is very different from that in China. There are many grasses instead of trees, so the vision is wider. What is more, when Chinese go to a park, they usually take a walk, but British people prefer to lie on the grass. So after lunch we decided to lie on the grass and take a rest just like Englishmen. We really enjoyed the sunlight and beautiful view there and had a great time. In the afternoon, we went back to the campus by DLR, and enjoyed the scenery along the way. In my mind, this is a day that we try to have a slower pace of life. Usually our life pace is very quick in China and it is kind of difficult for us to have enough time just lying on the grass for a whole afternoon. But I think it is a nice try and I really enjoy relaxing myself.